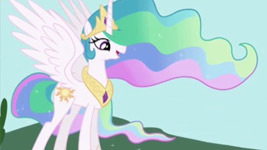 The regal leader and mentor to the main characters in My Little Pony Friendship is Magic, Princess Celestia holds a very visible and power position in the hearts of MLP fans. I hoped to bring this character to life in a way which truly captured how I saw her as a leader; strong, beautiful and mature. So here I am, 12 days into this costume. So many changes to get just the right effect, I hope it pays off. 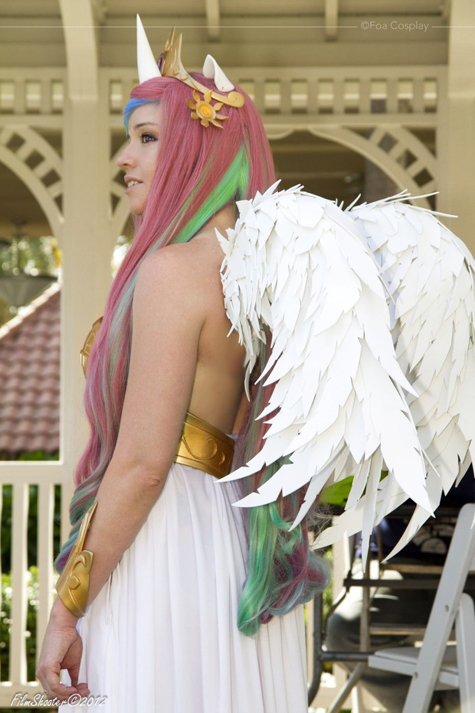 Last night I finished the Celestia Wig, and got the wings started. Today at work I got in some vinyl that I'll use for the harness and straps for the breastplate. Other than getting the wig taken care of I hadn't done much else for the day. I finished up the skirt the other day, adding a bit of an asymetrical sweep to the hemline, but other than that, there isn't much to it. I also learned that I am just horrible at hemming/cutting out things, because there are a lot of mistakes along the edge of that skirt. Oh well, practice makes perfect! 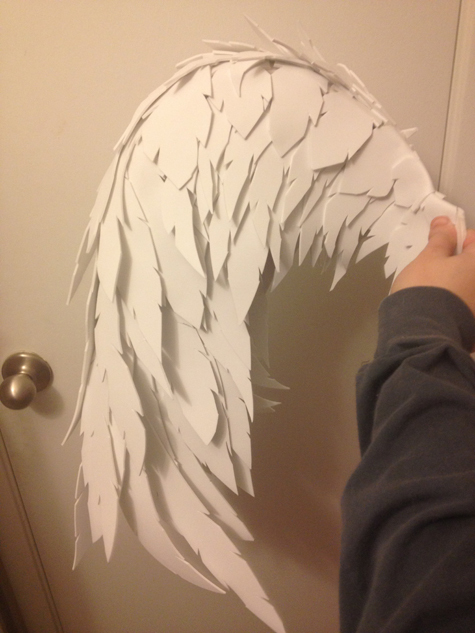 Tonight I plan on finishing the wings, but I probably won't xD. 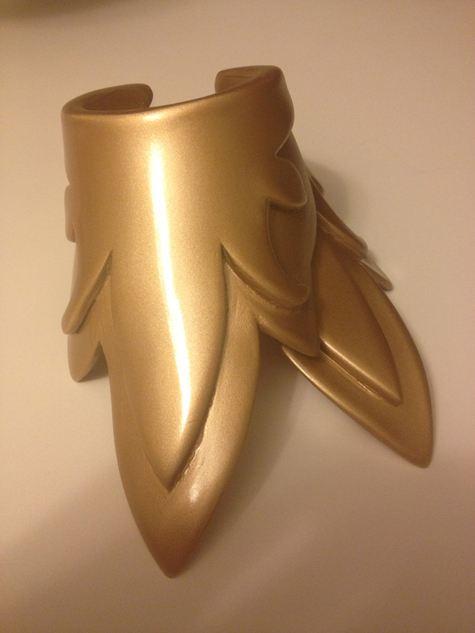 Wish me luck on that, and I'll also work on doing the final assembly for the rest of the cosplay. 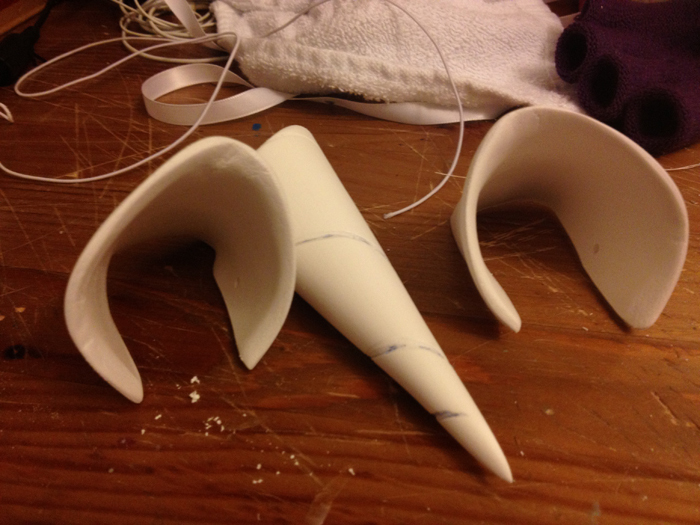 I need to get some sort of attachment for the horn, as well as the skirt, but those shouldn't be too difficult. Really in the home stretch now, and with over a week to spare! 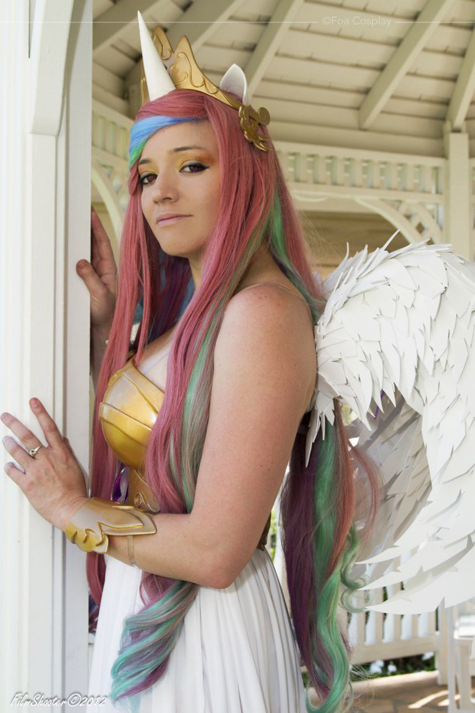 So here we are running into the 2 week period until Onicon, and I am trying to rush out the final details on this darn costume. 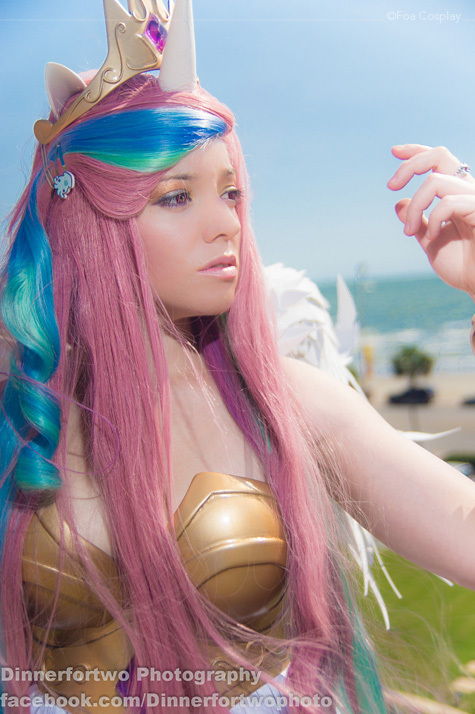 So far I've redone so many details of this cosplay, that I could probably have made it twice. I've got another set of resin gems curing on my work table, a curled wig drying propped up against my Deathscythe (lol), and a skirt waiting to be hemmed. 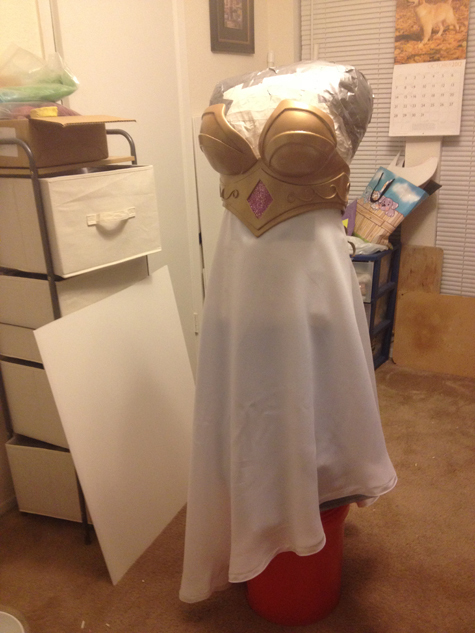 I'm debating about adding an asymmetrical flare to the skirt, but I'm undecided. 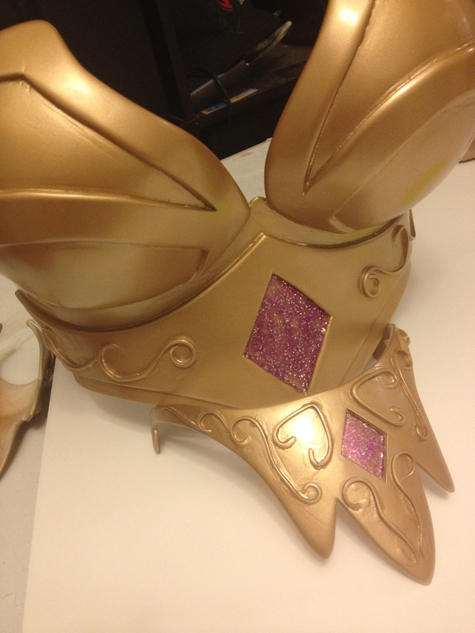 I’ve added some pictures to my WIP, which include the gold paint job I applied to the armor, a bit of a preview of my Celestia wig (yet to be styled), and some images of my first pass of gems. 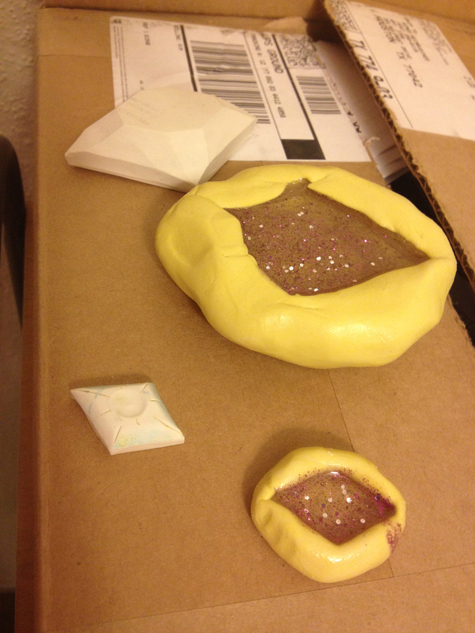 I’ve been using that putty you get at the craft store for molds, since I had it left in the house. What I can say about it is that I don’t really like it, except that it is clean and easy to work with. 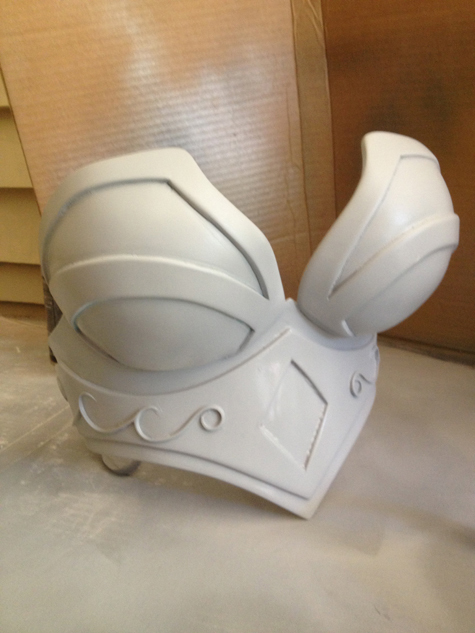 However it doesn’t make very good casts, as if you don’t pretty it perfectly over the mold, it creates bubbles and spaces that shouldn’t be there. 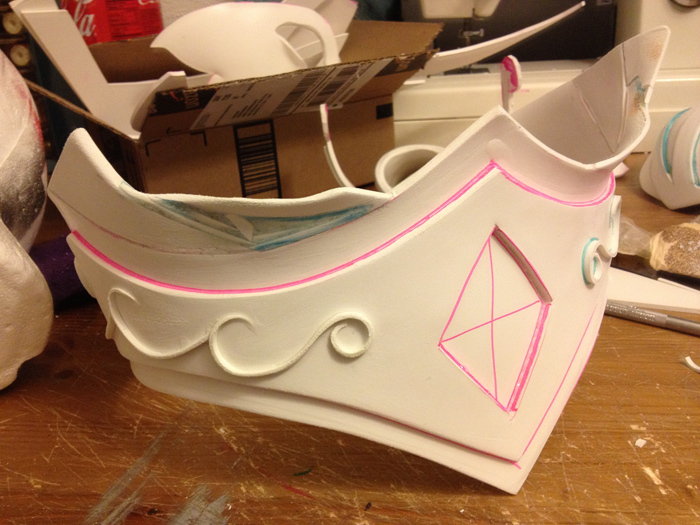 Tonight I plan to finish off all the small details, and have some semblance of a cosplay finished before I head to bed. 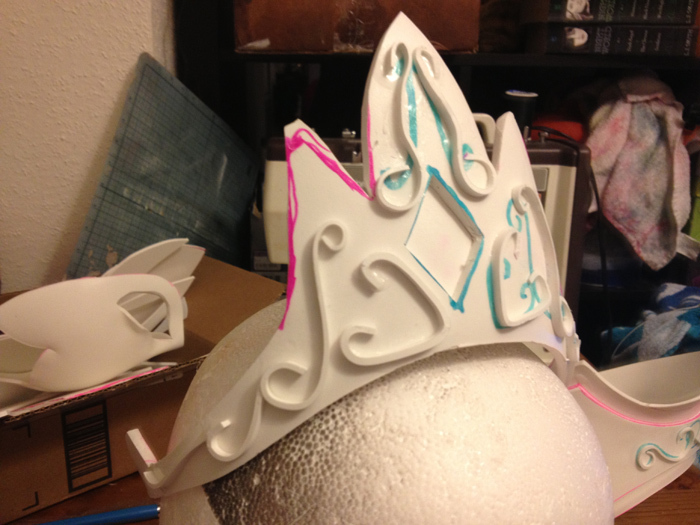 Lastly, if I have time, I’ll be fixing all the imperfections in the crown. 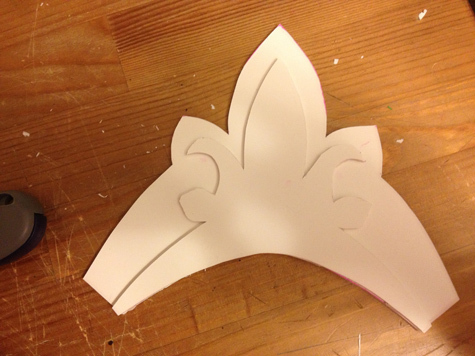 I had hoped that it wouldn’t have been so sloppy, but I was having difficulty with the sanding on such a small area. 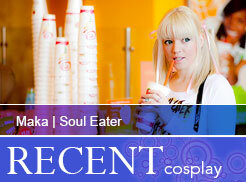 I’ll fix that if I am able before Onicon. Though I have to finish a commission this week as well. Here’s hoping! Oh my god... this weekend was insane! I finished so much with this project, and I'm hoping to be paint ready by tomorrow night. 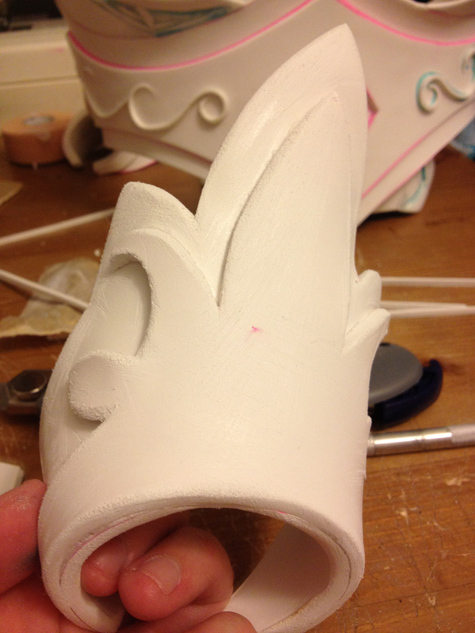 I've added all the detailing to the breastplate and to the crown. I'll need to trim down the edges of those detail, finish the first pass of sanding, and then move on to 150 grit, to get out the scratches from the 60! I also picked up some sharpies for the wig I'll be making. 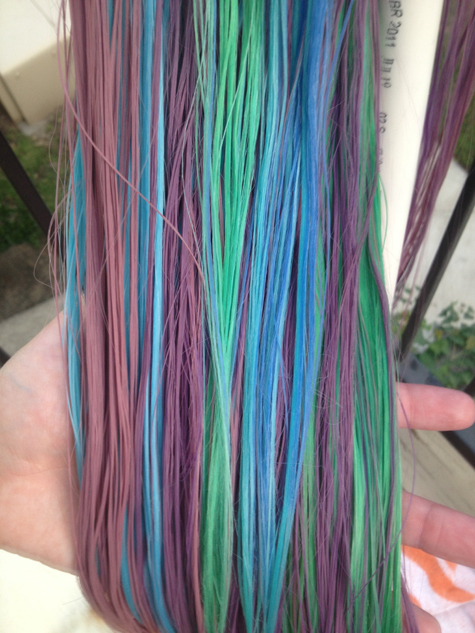 From what I've been reading, I'll need to let the dye sit for a day or so, to get the best color. So thats what is happening now. 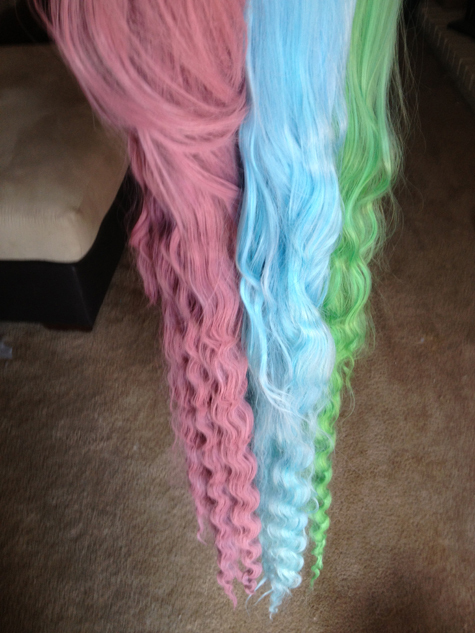 I've got a pink wig, and two blue ponytail attachments. 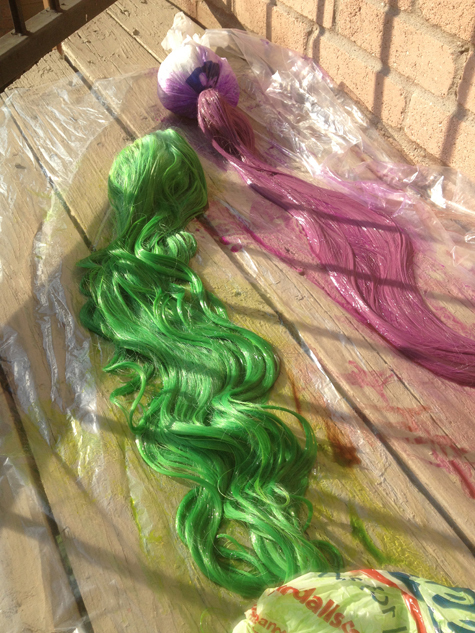 One pony tail will get the green treatment, while the pink wig will get half dyed purple. That is going to be fun. 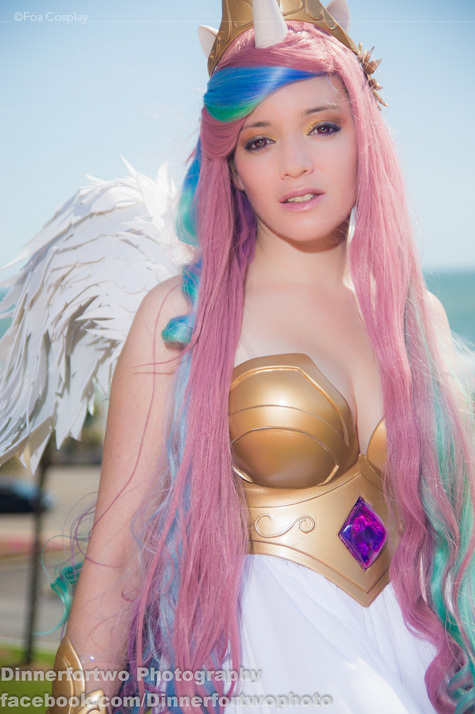 So I am wasting valuable cosplay time by updating the site, but I wanted to make sure that I keep the content updating.. you know.. seo and such (which comes to mind, I need to add the sitemap to google! 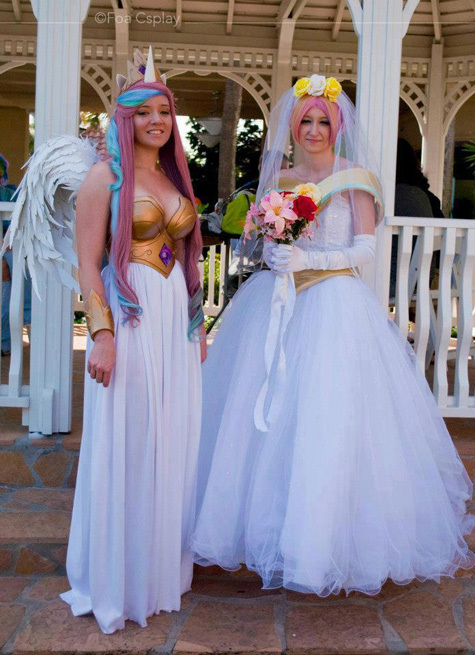 Anyways, Princess Celestia is underweight. I added a little WIP pic below, so you can sort of see where I am headed with this. 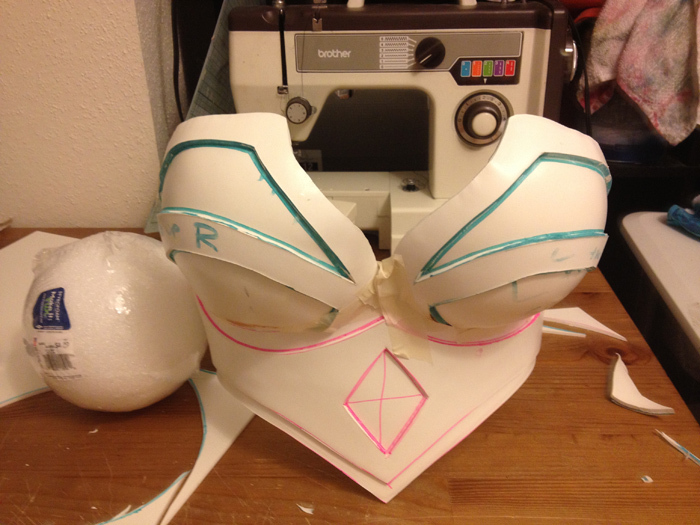 You know me and the breastplates, I just love'em. I went to the store and picked up what I think I need for the wig, which I'll be doing later this evening, wish me luck, and I also bought what I am going to use to make the wings. 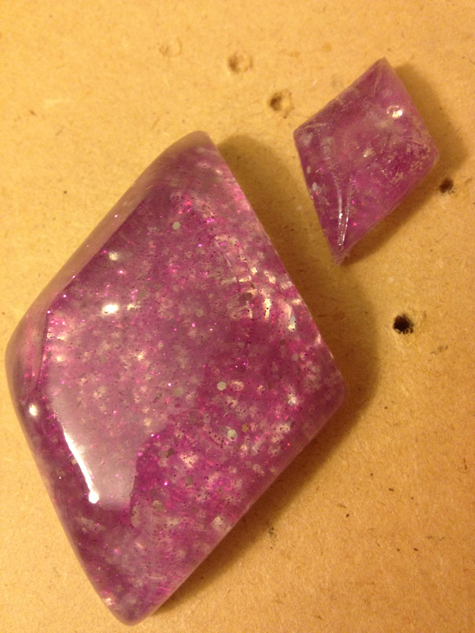 The only thing left to buy will be a little fingernail polish for the back of the gems I'll be casting and also I am debating of doing two layers of fabric for the skirt I'll be making, to help give it a more etheral look. 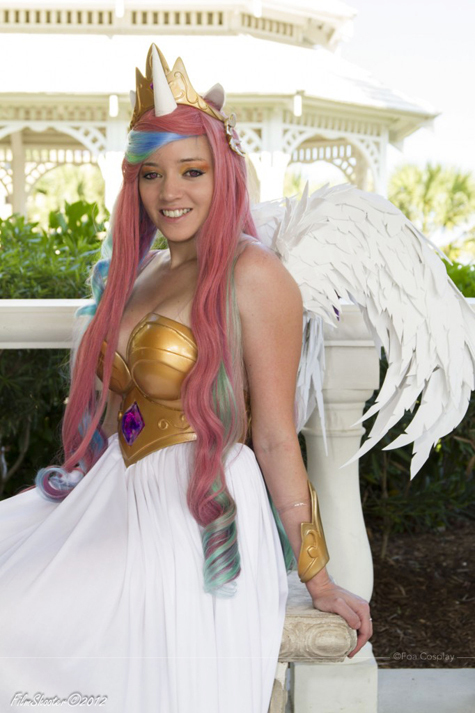 But the trip the store was alreayd more than I wanted to spend on this cosplay, so I dont' know if I'll put any more money into it. Anyways, That's it for now, I've got to get back to work!! 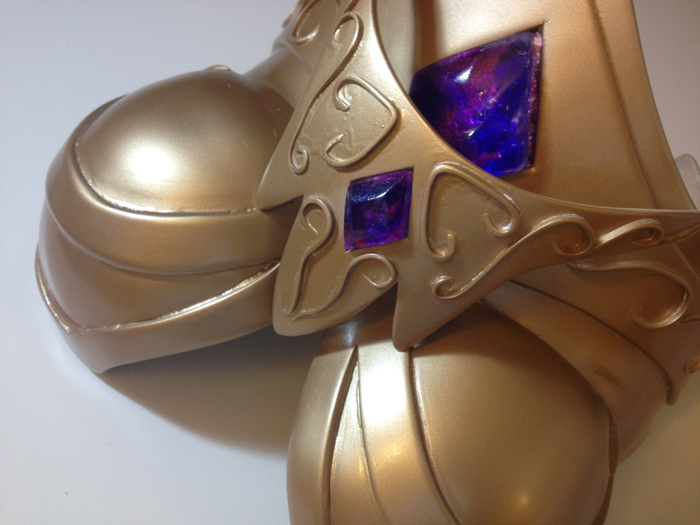 Also, I posted up a video of the breastplate in my Sintra Tutorial, Part:3, go check er out! 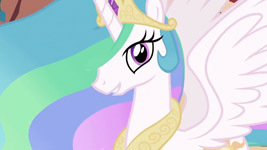 Now that the website is finished, I can finally start working on my next project, Princess Celestia. 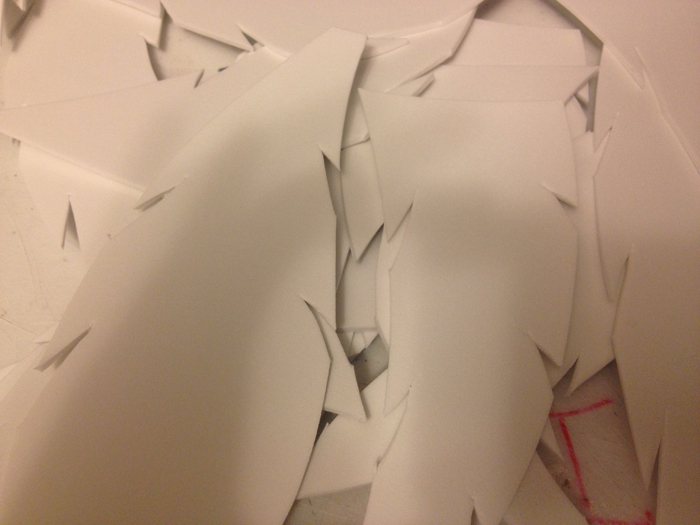 I am so excited about this, templates have alreay been rough drafted (I'll add some thumbnails for ya'll to see). I still need to do a fitting to make sure I measured out everything correctly, then I get to have the real fun and get to working on the sintra portions. 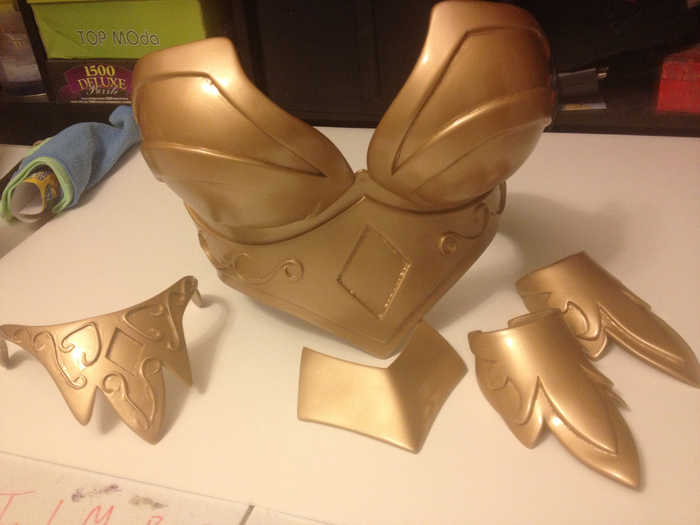 I still need to pick out a paint too, though I might just go with a basic gold that you can get at the store. Though... I'd love a chrome gold, that would be the best option. 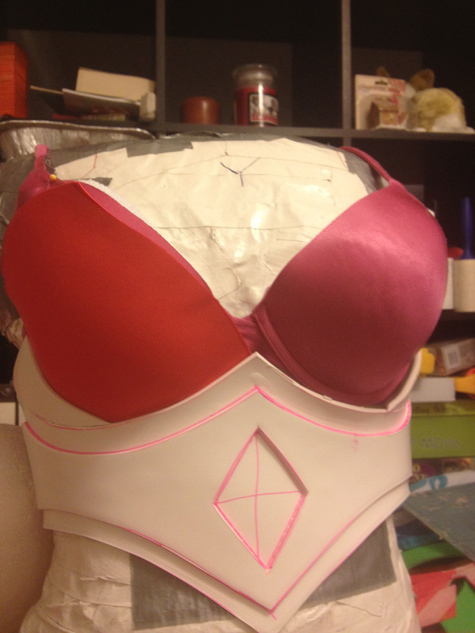 Cosplay – Hey this was easy on the tailoring side. My terminology may be incorrect here, but I made a finely pleated, floor length box skirt. 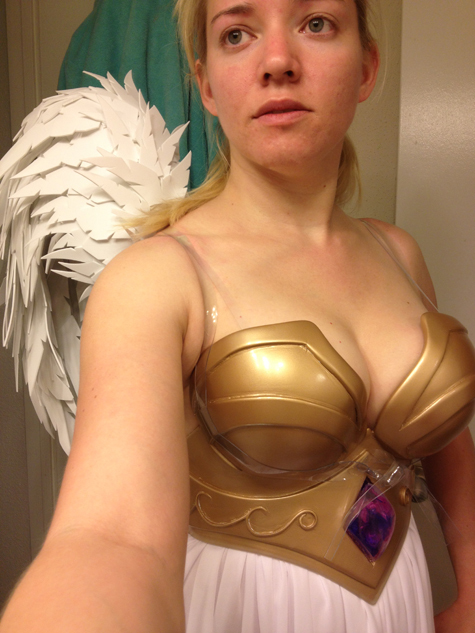 I added a vinyl strap to the waistband, which helped it stay in place under the armor breastplate. 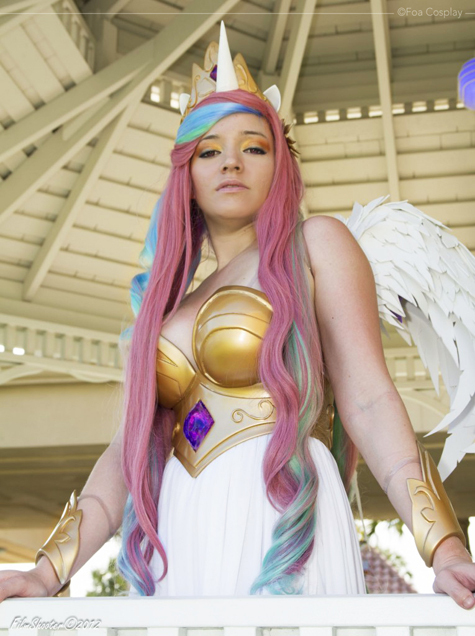 "I'm glad to finally finish this cosplay, as it was on my list for a long time. I need more pictures though... I've only got about 3-4 to share right now. 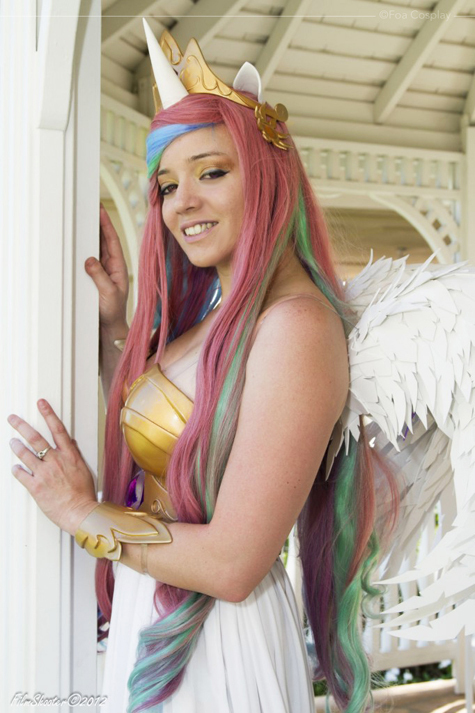 Boo..."
Wig – This started with a 52 or 60" straight pink wig, which I already had. I bought two pony tail clips in blue. 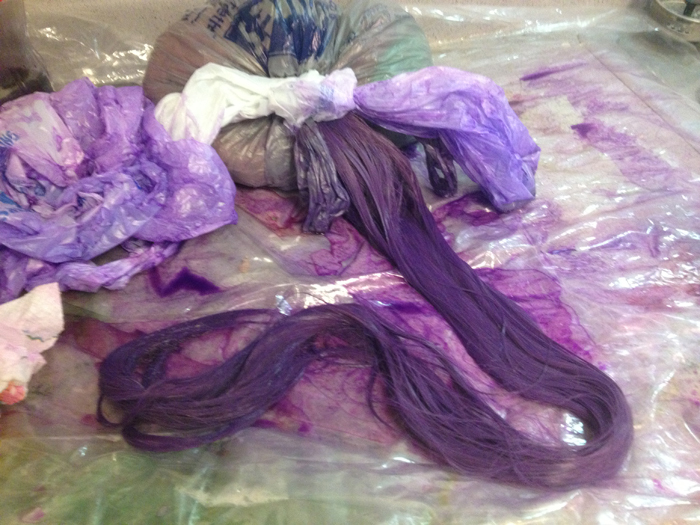 One ponytail was dyed green, while the underside of the pink wig was dyed purple. 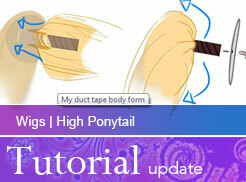 I combined the ponytail wefts just above the purple section of the main wig. 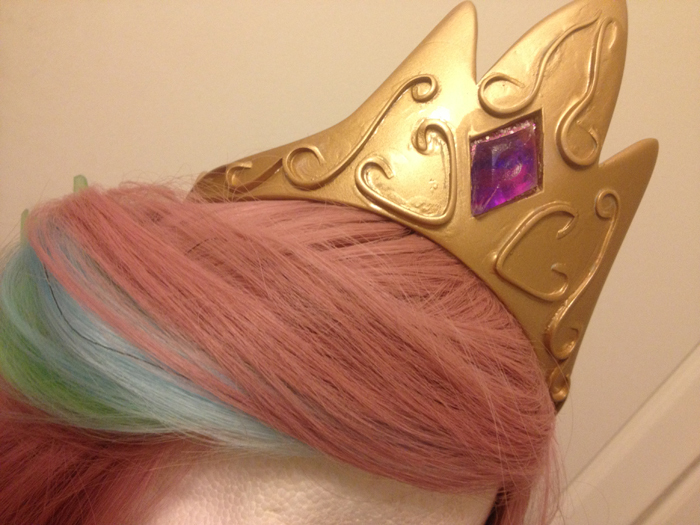 I also cut out samples of each color and sewed them to the underside of the hairline of the wig, for the multicolored bangs. 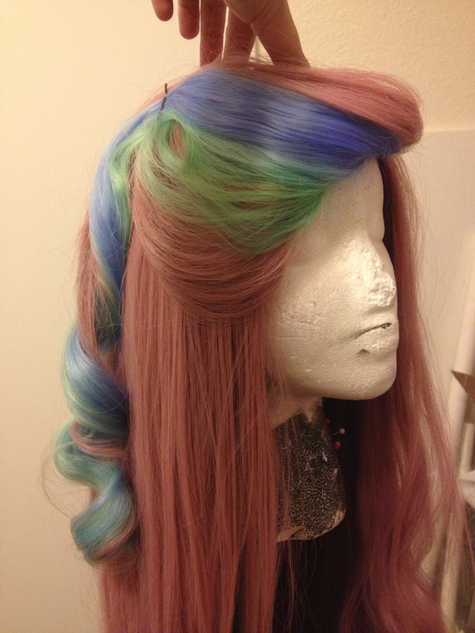 After the wig had been combined, I did several different curling attempts. 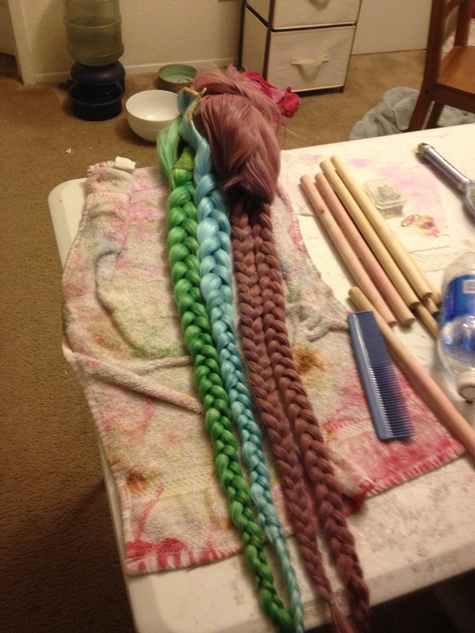 I tried a braid curl, which left the wig too full when brushed out, but too flat otherwise. Then I did real curls, and that worked pretty well. 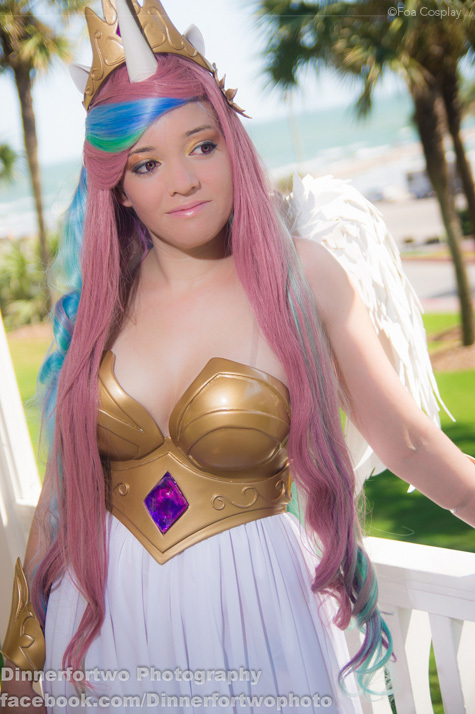 I used tinfoil to curl the ends of the wig evenly. The curling was done at the stovetop in a large pot of boiling water, wth a large dipping stick which my wig head was securly fastened to. 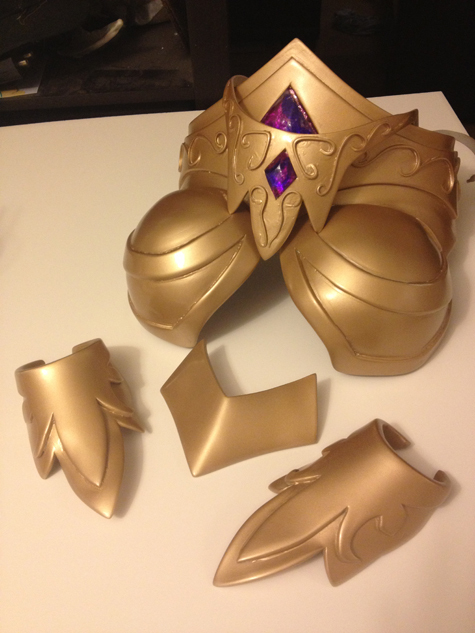 Armor – The armor portion of the this cosplay was done in my standard techinique. 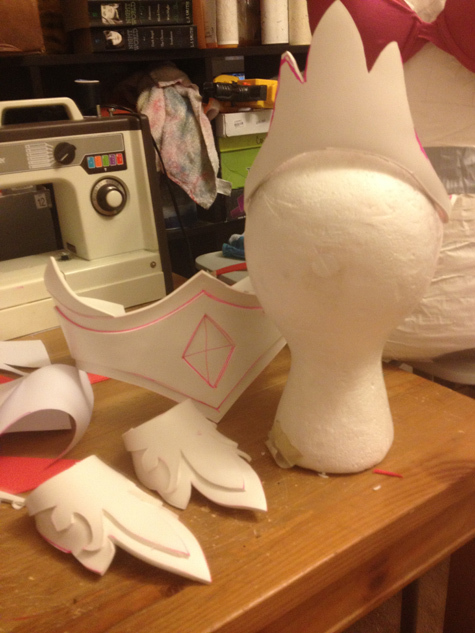 Using Sintra as the main compnent, I formed the breastplate, bracers, and crown. I also made a little cuteymark hairpin out of sintra. 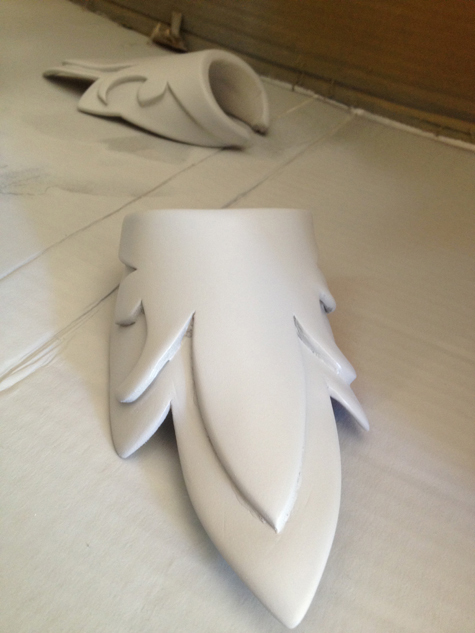 All painted with Duplicolor and then polished. 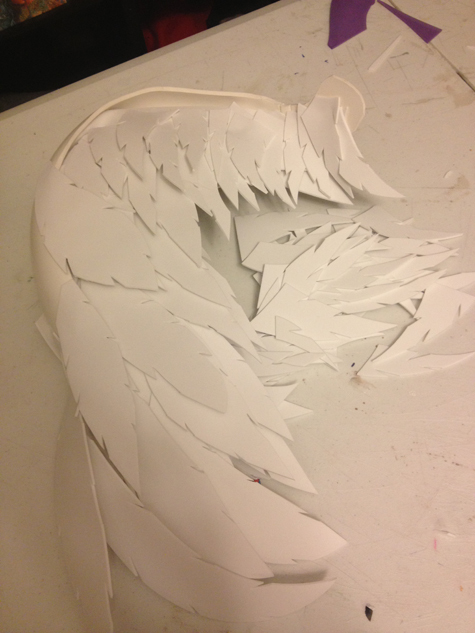 Props – My wings were made out of craftfoam, where I just eyeballed the different feather sizes which would be required for the look I wanted. 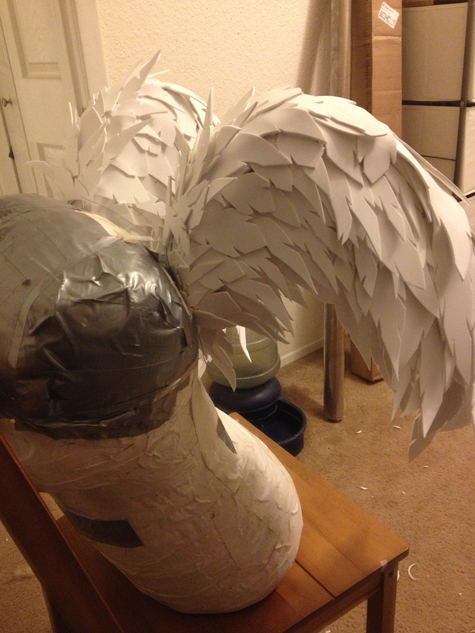 The base of the wings is created from Sintra, which I molded over a pool noodle to give it an arching shape.